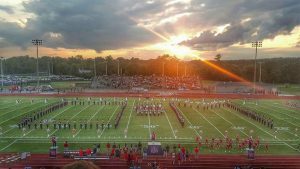 The Oak Mountain High School “Spirit of Cahaba” Marching Band, a cornerstone of the Fine Arts Department at OMHS, is made up of two hundred and thirty three students. The “Spirit of Cahaba” performs at all of the high school’s football games as well as two marching contests throughout the fall, consistently garnering superior ratings and capturing many of the best in class and best overall awards at these contests. Each year, this ensemble marches in the annual Oak Mountain Homecoming Parade. In the spring of 2017, the band performed in Orlando, Florida at the Festival Disney Marching Competition in Walt Disney World. On April 14, 2018, the band will be performing in Washington DC for the National Cherry Blossom Festival Parade.